Hello friends! I hope this finds you all well and enjoying some lovely spring weather. In my corner of the world, it is cloudy, cool and well....the heat just came on. With that just barely said, the sun literally popped out....oh never mind....it's gone now. But there's always hope! I see patches of blue sky and I believe that it is supposed to get warmer by the day. My latest sewing project is the bag you see above. A few weeks ago I purchased some graphics here on ETSY. I have been experimenting with the graphics and various methods of printing and transferring them to fabric. In this project, I printed directly onto an 8 1/2 x 11 fabric sheet. I was extremely happy with the quality of the artwork and my printer did not let me down. I have long loved the painting of The First Kiss (1890) by William-Adolphe Bouguereau. I only recently learned that this is not in fact the original name of the painting. It was originally L'Amour at Psyche Enfants which translates as Cupid and Psyche as Children. As I understand it, it incorrectly took on the nickname Le Premier Baiser ,or The First Kiss and it apparently just stuck. I have always called it the First Kiss. 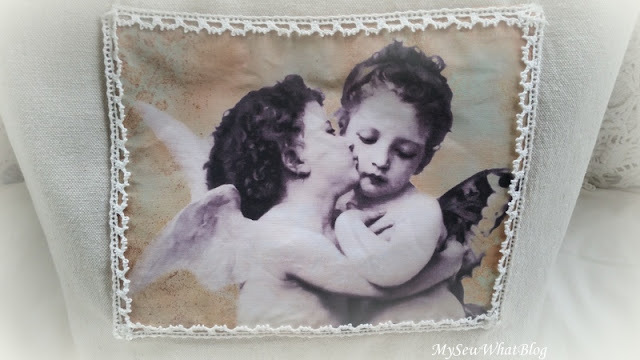 I stand corrected.....At any rate, I love these two little kissing cherubs and was excited to see it among many lovely digital downloads on Etsy. Printing directly on the fabric sheet produces a nice soft print as opposed to some iron on or other transfer processes. I actually experimented with printing directly on my own fabric and it was also a success. Of course it took me nearly three days to work up the nerve to place raw-edged fabric in my printer but after ironing it on to a piece of freezer paper, it printed remarkably well. 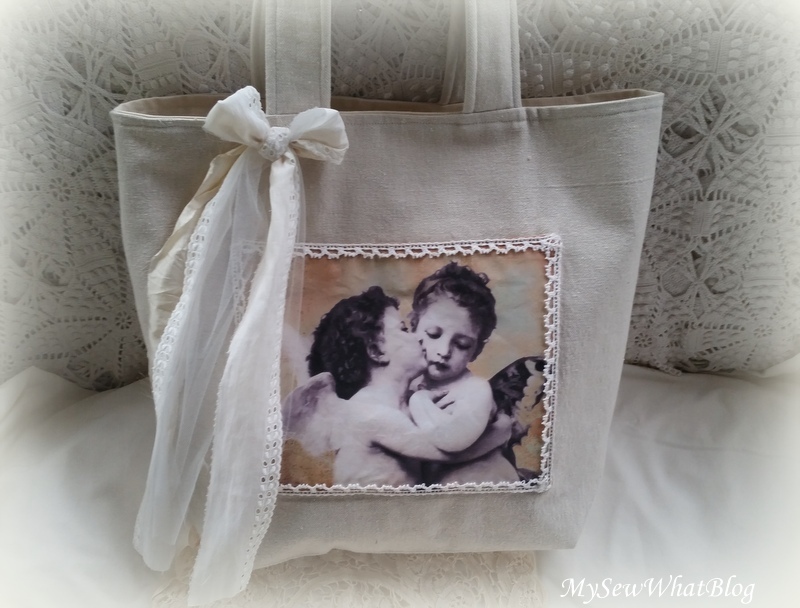 I used the artwork as the pocket on my tote bag and framed it in a little cotton edging that I purchased on one of my lace/doily/vintage hunting excursions. 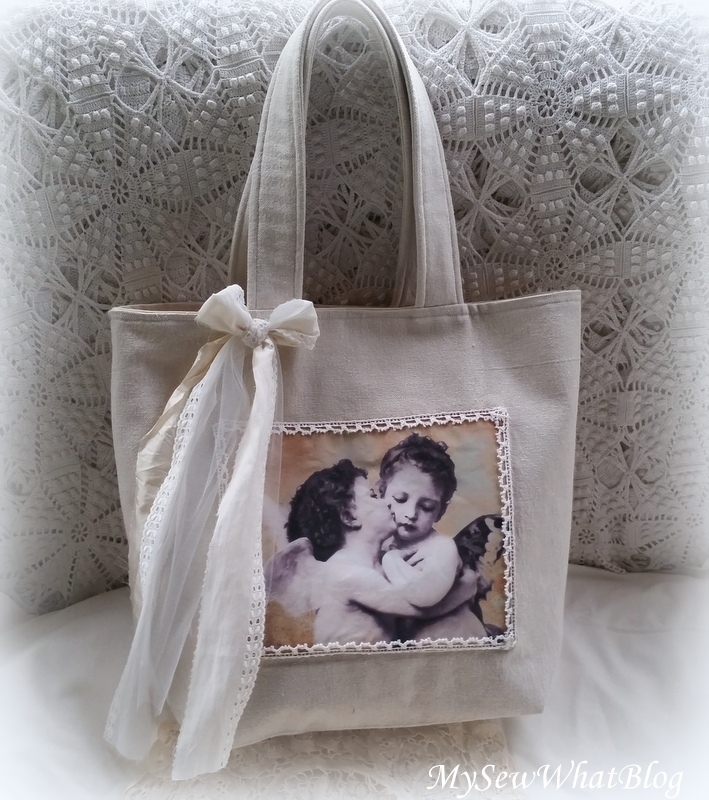 I really wanted the artwork to be the focal point of the bag and not get swallowed up by lots of embellishments. 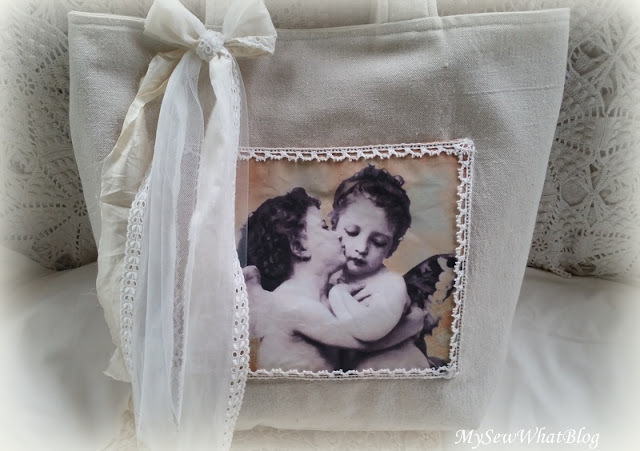 I did add a shabby bow of sari ribbon, tulle and vintage eyelet edging which I think adds just the right amount of embellishment without taking anything away from the sweet image. This was not one of those projects that I started and finished in the same day. I actually have been working on it little by little as we have been very busy during the past couple of weeks. June is always a very busy month--usually of celebratory events and this June was no exception. I am happy to have some time to spare today to post and do a little catching up on my blog reading. Take care friends and as always, thank you for stopping by! PS The sun is out!